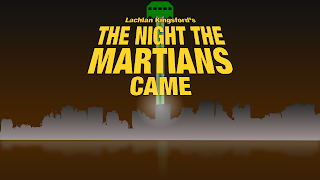 I'm slowly continuing along my path to make Space Invaders - or, as my game is called, The Night The Martians Came. Actual progress thus far falls along having made most of the graphical assets. Coding has barely started. What instead I've been doing is starting to learn some basic OpenGL. I don't know if I want to use OpenGL for all my blits (Blitting: Putting a picture or piece of gfx on a surface (like the screen)), or whether I want to stick to SDL. The prime reason I'm learning OpenGL is so I can get the graphics card to handle scaling and resizing, without me having to quite so much. This means I'll be able to make bigger screens and smaller screens work, and maintain a reasonable speed to play. SDL_GFX on the other hand, provides scaling functionality, but is really too slow to use in realtime. The actual thing I'm debating is whether I make up the image in SDL, and punch it into OpenGL or just stick OpenGL all the way. I think I'll figure it out better as I progress with OpenGL. It natively provides a lot of things like scaling and rotation that SDL doesn't. I'm not a fan of OpenGL so far. It took me ages to get a tri to the speed - but, that is probably more due to my lack of 3D coding experience then OpenGL itself. But I'll get there. Hopefully, still within a month. Really - there shouldn't be too much coding to do - though substantially more then pong.